There have been several forum threads for decks centered around subpar attackers, by all kinds of people. Some refuse to play anything unless it’s rarely seen, some want to try something out of the newest set, and some are convinced that a card can be broken just because it looks like it might do something. Electromagnetic walls are like fire walls; nowhere close to BDIF but it works best with acceleration. 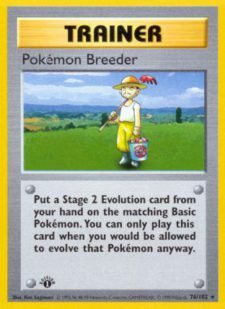 The best cards in format aren’t always the ones with the most obvious combinations and gimmicky Abilities, short of some EX cards (such as Darkrai), but Pokémon with Abilities that sound too good aren’t as helpful if they have to evolve. A lot of these make good decks for fun, to take to league, or to learn or teach someone with. Most of these subpar decks teach things that tier 1 decks aren’t restricted by, such as evolving, or one Energy attachment per turn. The point of this set of articles is that while these decks aren’t good enough to win a large tournament, they aren’t bad and they aren’t strictly teacher decks. These are decks that have had bad lists across the forums, on PlayTCG, and on PTCGO, but I’ve worked out lists for popular almost-junk rares that can contend with at least one metagame deck. This isn’t built to be cheap and it’s not built for people who just started their collection. Everything in this series is what I’ve worked out to be a fully-functioning, optimal list, for people who may have bought the staples but don’t have a full metagame deck, or to teach someone at league who may have bought staples but is still learning the game. Or just for fun. I won’t deny that I enjoyed testing this. When Dragons Exalted came out, I was one of the people insistent that Ampharos DRX didn’t work. 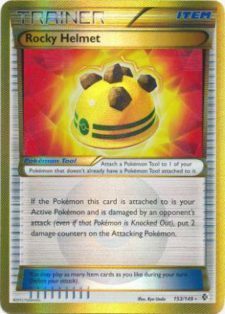 I tested it for this article when the set was released and it was too slow; by the time my opponent set up, the damage from attaching Energy wasn’t enough. 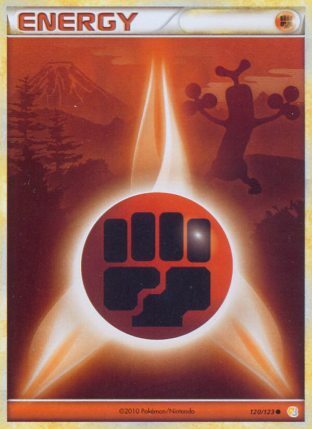 Eelektrik decks that used Skyarrow Bridge and Dark Patch decks with Energy Switch or Hydreigon could play and never attach Energy from their hand at all. Even with an explosive start of an Ampharos attacking on turn 2, it didn’t last. There is no such thing as Hammerspace in this deck. The problem here wasn’t the lack of Skyla or a bad line of draw Supporters (usually), it’s that lists were too gimmicky. You can’t afford more than a few slots to anything but consistency, and there are better gimmicks than Rocky Helmet and Hammers in an aggressive Stage 2 deck. But even without those cards, the deck never succeeded. Whenever I played against this deck, I noticed my opponents were often instead stacking Energy onto Mewtwo or Tornadus or Rayquaza, any other attacker in their deck. I lost all faith in the deck because apparently the main attacker was so bad, even the people who played it preferred to use the techs. Boundaries Crossed gave us Skyla, and a slight meta shift. Darkrai EX is still around, but Eelektrik variants are dwindling and we have to deal with Blastoise instead. That’s a little in Ampharos’ favor, but at first I still didn’t think it was enough. A little while, I ended up with a list that was suddenly ripping apart decks that have been hyped to Johto and back. Gave away all my candy on Halloween, do you accept these? This is pretty basic, just an hourglass Stage 2 line. 3-1-3 gives you room for the other Pokémon but is still heavy enough that you can stream them and get one Active by turn 3. This line can be thickened to 3-2-3 or 4-1-3, for example, but too far and you won’t see anything else. Four Rare Candy goes in no matter what the line. You need Ampharos out ASAP, and it’s harder to get Candy than a Pokémon. Pokémon can be recovered from the discard, Rare Candy can’t. This is a Stage 2 deck, and with every Stage 2 deck, expect to have to buy Rare Candies. I didn’t try Eelektrik immediately, simply because Ampharos doesn’t discard Energy and Eelektrik would take up a lot of space. Most Ampharos lists I’d seen previously were all no Eelektrik, or a full line of it, so I played extra Super Rod instead. Obviously that didn’t work, but just getting out one Eelektrik can help more than an extra Super Rod ever did. The extra assurance in discarding Energy allows for more convenient Ultra Balls and Computer Searches, most importantly. It also means you can retreat by discarding Energy more safely, or fully power up Tornadus EX or Ampharos in one turn paired with DCE. But what killed Super Rod was that it couldn’t keep up with lost Ampharos (in a 4-2-4 line at the time); most opponents will see Tynamo and immediately try to KO it, knowing it’s support in most cases. 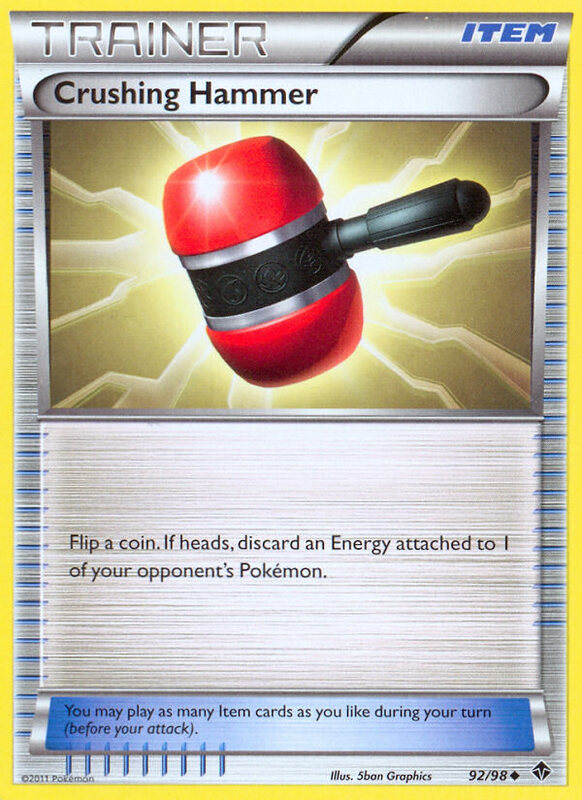 With Super Rod, you lose a Pokémon, you toss it back in the deck. You then need to get them back out and run out of Supporters. While Eelektrik may take up more space than Super Rod, it was infinitely better. If you lose Ampharos, you can Super Rod it back in, but consistently recover the Energy. And if you lose an Eelektrik, there’s still Ampharos able to attack. I don’t recommend thickening this line, as you aren’t relying on discarding Energy, and you can still power up Pokémon with only two Energy cards. 3-3 at the absolute most, in my opinion. Tynamo DEX 45 can also be used instead. I’d splurge and get the non-promo if I were you, I don’t trust this guy’s broken arm. Mewtwo EX goes in almost every deck and you have both DCE and Eelektrik. It’s in a tin now, one copy minimum, two at most. This is used mainly to finish off KOs, have an early attacker, or counter opposing Mewtwo. You don’t want to Dynamotor Energy onto it and attempt to sweep. Honorable mention to Tornadus EPO: I don’t like it. I don’t play it in this deck, I don’t play it in any deck. It can be substituted for Tornadus EX (the number of combined Tornadus shouldn’t go above three) if you prefer it or think it’s good. It’s not required as a Sigilyph or Bouffalant counter, you have Ampharos already. Tornadus EX is obviously there as a Fighting counter, for teched Terrakion and Landorus EX in decks with Prism Energy or Blend WFLM. If the deck is just all Fighting types…hope to get lucky, I’ll explain what little you can do below. But just Ampharos won’t be able to take out more than one Terrakion. If not Tornadus, you need at least one Pokémon that can take a hit from Landorus EX. Notice I play Tornadus EX without Stadiums. Originally I tried it without a Stadium and Eelektrik, and it didn’t go well. None of the Stadiums benefited me more than my opponent, and it was hurting. I considered replacing it, but I put in Eelektrik and that problem disappeared. You can pull off Power Blast more consistently with this. Honestly there’s not much room for anything else, and testing didn’t prove great for anything. You need at least one Mewtwo and you need at least one Pokémon that can stand up to Fighting types, but there’s still a little room if you cut down on those two. 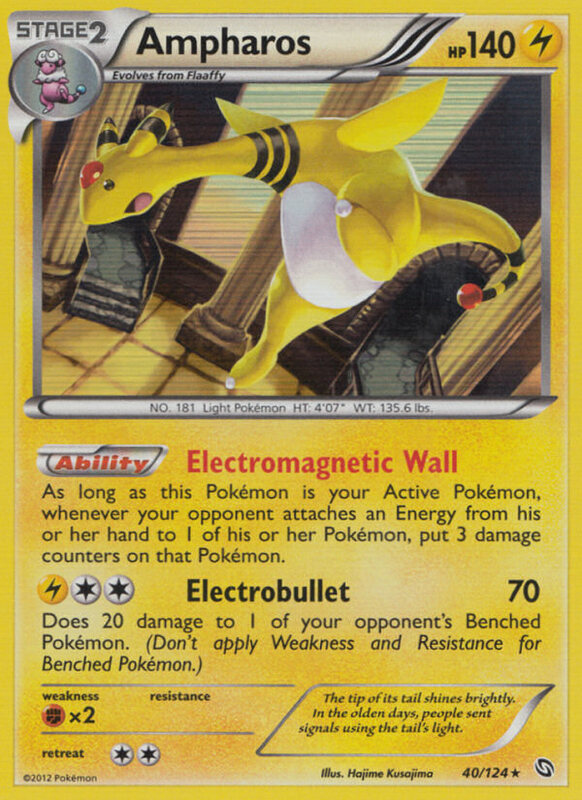 Things to keep in mind are that you already run four Special Energy with DCE, if you’re not attacking with Ampharos then something is probably wrong, and that you can’t completely rely on Dynamotor without changing the deck’s focus. Landorus EX – I thought this might have been okay for knocking out other Lightning-type opponents, but this deck wasn’t struggling with them too much at all, and I never got to use Land’s Judgment (not that I would want to). I was totally okay starting with it, but late-game I just wanted it gone. 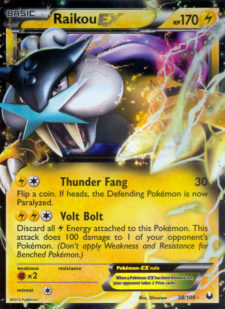 Terrakion NVI – I like Terrakion in Eelektrik decks, but this isn’t Eelektrik, it’s Ampharos. Retaliate doesn’t work if you can’t get Blend and have an Eelektrik on the field and you’re able to retreat to it after powering it up. Not worth it, in my opinion. Zekrom BLW – If you were to add in Eviolite, the self-damage wouldn’t be as much of a problem. However the way I most often tech Zekrom is to either counter Sigilyph DRX, or have an attacker that doesn’t give up two prizes, both of which you already have covered here. 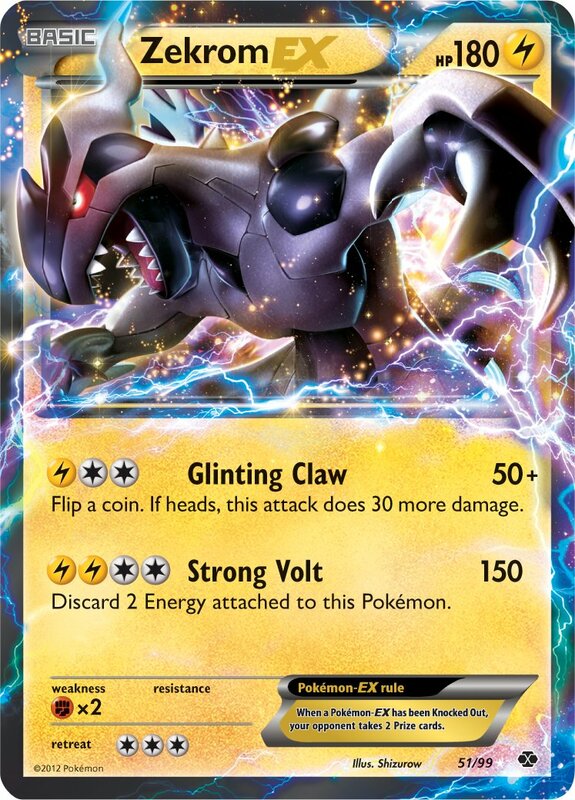 120 damage isn’t different enough from 70 + 20 snipe + Electromagnetic Wall in this format to add it in, and it’s often KO’d before it’s powered up..
Zekrom EX – It’s not great to begin with, and even when you do get it powered up, it discards Energy. A heavy hitter but pretty meh overall. 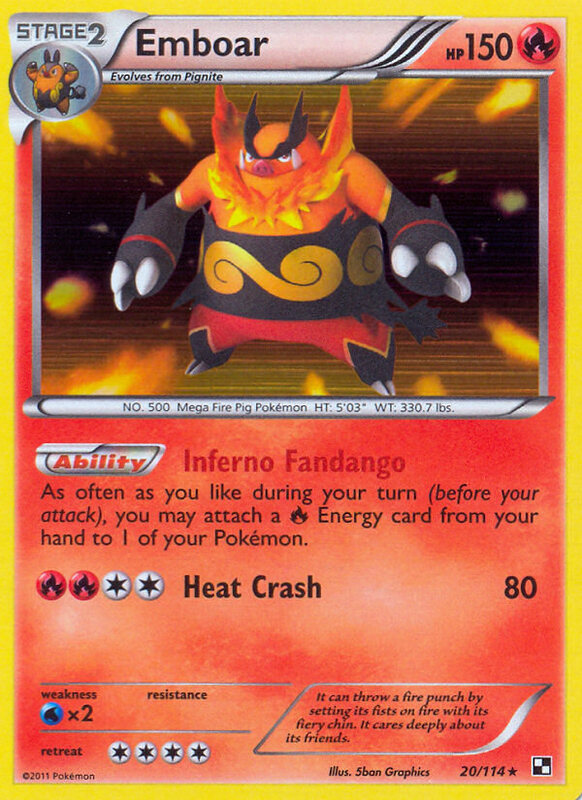 Zapdos NXD – Landorus’s Land’s Judgment still OHKO’s it, but it’s better to force your opponent to lose their Fighting Energy on a Zapdos than your Ampharos, and it gives up less prizes than Tornadus EX. 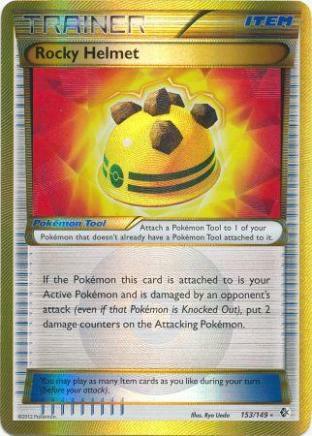 If it had better attacks or some more HP, this would be less of a problem card. 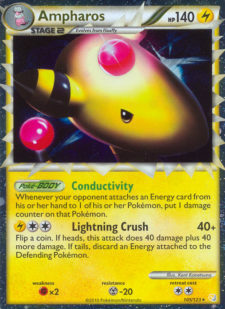 Registeel EX – I had a few hopes about this beforehand after using it in an Eelektrik deck, since Triple Laser sounded like a decent substitute for Electromagnetic Wall in theory. It hits for 30 in multiple places, makes a good wall, and does a good job at finishing KOs or softening EX Pokémon. Otherwise, it’s not different enough, or sometimes not even reliable enough, to warrant a space. Bouffalant DRX – It works as well as Bouffalant in most other decks. Some people like it, I don’t bother with it, take your pick. Emolga DRX – Same as Bouffalant I think. Honestly I started with it once when I played two of them, and only used Call for Family once; I prefer Level Ball and Ultra Ball here, especially since Emolga means you’re not leaving Ampharos Active if it’s not the first turn. 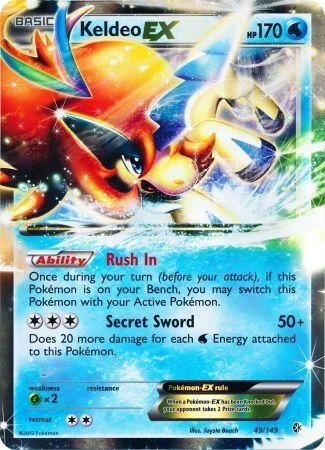 Keldeo EX – Keldeo is a good defense against Special Conditions or Catcher-stalling usually, but I’m not a fan of it without more Eelektrik or Skyarrow Bridge to allow it to retreat. It’s not a reliable attacker to counter Landorus EX or Ho-oh EX without more Eelektrik either, so while DCE and Blend help it, it’s too many cards. 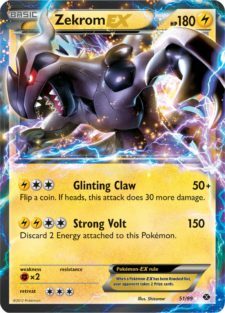 Black Kyurem EX – It’s really not that worth it to put in any Dragon-type for coverage, as this deck has a positive matchup against the most prominent Dragon deck (Rayeels; Fluffychomp is borderline nonexistent now). But even if you use it, it just takes too long to power up, you have to waste Switches to attack again, and then you’re tempted to use Crystal Wall which just wrecks the focus. For the most part, these are your basic draw Supporters. N is a good card and all decks run four. Four Juniper is safe to run with Eelektrik and Super Rod. I prefer Bianca over Cheren here with Ultra Ball and Computer Search, but Cheren is still an option. This number can be raised or lowered, but not by more than one lower or two higher. Two less draw Supporters puts you in too low of a consistency range. Random Receiver is an option that can be considered. Skyla is part of what makes this deck work. You can get the missing piece to complete a turn 2 Ampharos, whether it’s just the Rare Candy, Ultra Ball for Ampharos, or Computer Search for DCE. Getting it for Switch and Catcher is standard, as is getting a draw Supporter to use on the next turn. One more can be added, no less than three unless replacing it with another (good) Supporter. I tried to save you $40, but Nintendo mailed me a cease and desist for having copies of these. 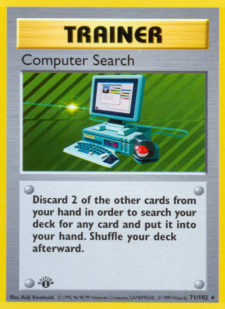 For the reason listed with Skyla, Computer Search is the only ACE SPEC that goes in here. Not Gold Potion, Computer Search. Level Ball is almost a requirement for Tynamo and Eelektrik, but is even more useful because Mareep and Flaaffy can be searched out. I added three for this reason, but it can be reduced to two. With Ultra Ball, it’s a three minimum, four possible, due to it being able to search any Pokémon at any time, whether it’s Ampharos or one of your tech attackers to counter something. I believe two Super Rod is the best number here, although one works, if only slightly less. If you’re quicker to play Juniper and Ultra Ball, keep it at two, or potentially raise it to three (I found this to be a little much). Three Switch is a good number, four may be a little high, two works. I’d lean against putting in only two, especially if you add in a high-retreat attacker such as Terrakion or Registeel EX. Four Catchers is standard. I believe that for Tools, you need a Tool-heavy build or a Tool-free build, simply because Tool Scrapper means that only two or three Tools in a deck gives you that many dead cards. There’s not enough room for more than a few Tools but if you still want some, these are my notes on them. 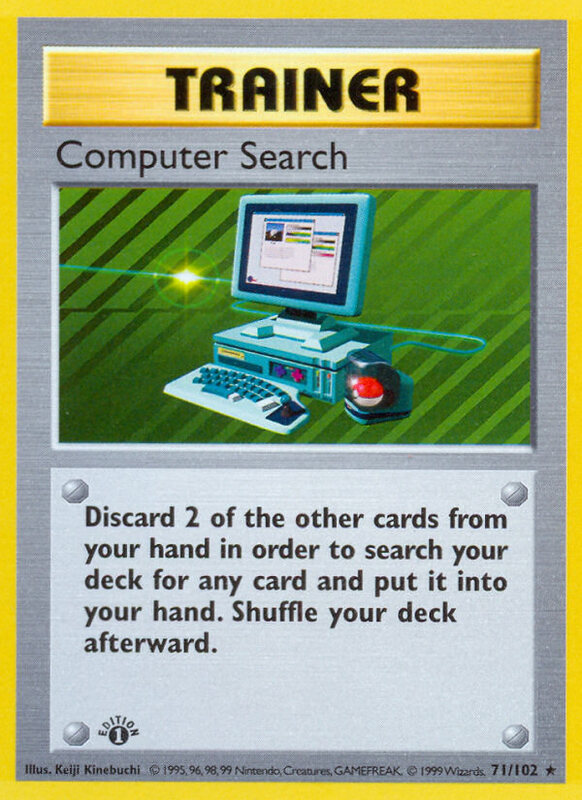 Note that these are only to cover bad matchups or fill in spaces for missing better cards (such as Computer Search), and none of these are optimal. Eviolite – If you put Eviolite on a Pokémon, it has to be a Basic. If you’re attacking with an Eviolited Pokémon, you aren’t attacking with Ampharos. 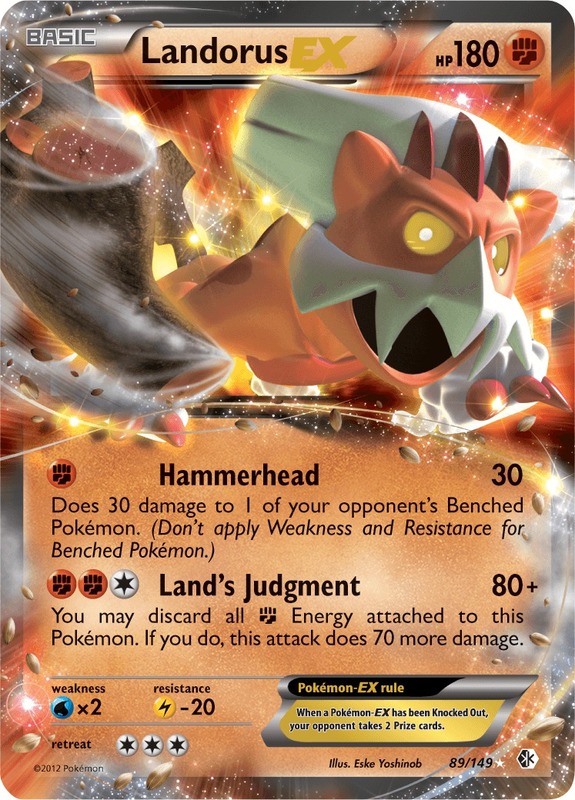 I could see this in a meta where Landorus and Terrakion are teched into almost every deck (it won’t save you against a full Landorus/Terrakion), but otherwise, it distracts from the focus in my opinion. Exp. Share – You have Eelektrik. I didn’t test much with Exp. Share replacing Eelektrik, but I liked it as much as replacing Eelektrik with extra Super Rod. 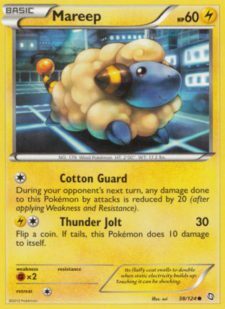 Giant Cape – This is probably the best Tool for the deck, to counter a meta full of Pokémon that hit for 150. If your Ampharos is getting OHKO’d often, this did help against Hydreigon DRX 97 and Zekrom EX. However note that decks with these two are some of the most likely decks to tech Tool Scrapper. Rescue Scarf – I’ve seen several Stage 2 decks play Rescue Scarf (namely Hydreigon and Garchomp), but I don’t like it. You have Super Rod, and getting back only Mareep and Ampharos is useless if you’re out of Candy. 3-1-3 Ampharos is enough that putting them back in the deck keeps them going. Rocky Helmet – No. I said above this is one of the gimmick cards that was killing this deck’s ability to do well, it’s not worth it even if you have a playset of secret rare Golden Helmets. While I sometimes only play one Stadium in a deck as opposed to many or zero Tools, I think a Stadium has to be really good to warrant a spot. And in this deck, no Stadium is so perfect that it belongs. But like with Tools, you may like one of them, or you have extra slots, so here are more notes. 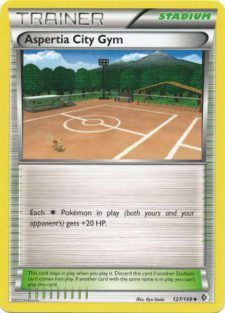 Aspertia City Gym – It works with Tornadus, but this is the exact same as Eviolite. It doesn’t help Ampharos, and it doesn’t help you against more than a teched Fighting type (Eviolite does a better job). Not good, not the worst, I always felt I’d rather go without a Stadium than have this one just in case. Battle City – It tends to help my opponent more than it helps me. I don’t like this card in general for that reason. Pokémon Center – Automatic no, it lets your opponent heal off snipe damage. Skyarrow Bridge – Pretty much the same as Eviolite and Aspertia Gym. While this one means you can retreat Basics out early on, discarding the Energy isn’t a problem with Eelektrik. Usually helps my opponent more often. Tropical Beach – You can attack on the first turn, but if you manage to get it out that early, Ultra Ball or Computer Search then Beach may be better than a small amount of damage or Cotton Guard. However this happens rarely, and only a few decks this format attack on the first turn so you’re very likely to help your opponent. Save your Skylas and Computer Searches for better targets. Make sure you’re using the Ampharos that damages your opponent when they attach Energy from their hand. The number one thing here is: attack with Ampharos. The secondary attackers are there to wall with while you power up an Ampharos or to counter something specific. If you can safely attack with Ampharos and you aren’t, you’re playing it wrong. You don’t wall with Ampharos and power up a Mewtwo EX on the Bench to sweep with in the end, you keep that Ampharos Active. The whole point of this deck is to abuse that Ability every turn possible, so unless you’re going to lose an Ampharos and sending up a secondary attacker will save it, attack with Ampharos. When it comes to placing your starting Basic, Mareep is a good choice with its Cotton Guard attack. It won’t be donked by Mewtwo EX or Landorus EX that way, that’s always positive. But if you have a DCE in hand and also draw Tornadus EX or Mewtwo EX (or another attacker that attacks for CC), it’s a case where placing something not-Ampharos is allowed. Tynamo is the worst starter, never place it if you have another option. Priority: get an Ampharos Active as soon as possible; this can consistently be achieved by turn two or three using options that I didn’t label as “not recommended” above. Second priority is Tynamo and Eelektrik, distract your opponent as soon as you’ve started punishing them for placing Energy. If your opponent is playing anything with a type that you have a counter against, pull those out with Ultra Ball and start Dynamotoring as soon as you can. Catcher-KOs are good for those Pokémon that have 150 or 160 HP. If you Electrobullet twice and survive (or have replaced it with a second Ampharos), there’s no reason to attack with 70 damage a third time short of having only one Catcher left. Catchering up a new Pokémon and letting that 20 snipe KO their attacker is about as efficient as efficient gets for this card. Most of these lean negative or are borderline autolosses, to be perfectly honest. This isn’t a perfect deck, and it’s in the wrong format to shine. What makes it worth it is the fact that it has some surprisingly good matchups and could be used to learn some of the finer things about strategy in the game (and I really like writing about subpar and beginner decks more than reiterating the meta). Just cry and hope your opponent scoops out of pity. I haven’t been able to beat a straight Fighting deck so far with this; I can barely beat them with my own Eelektrik deck and I’m teched out against them. This may be a personal problem against Fighting decks, maybe someone else has better results, but with the Weakness, Resistance, and access to Exp. Share and Eviolite, it doesn’t exactly go in your favor. I’ve come close, and I’ve done it the same way every time. First thing, focus on streaming Tornadus (EX is best), which means this strategy won’t work if you only play one. You still want to play Ampharos, as it can soften up Terrakion for an easy 30 + 100 KO with Tornadus EX, and it only gives up one prize. Fighting types can’t OHKO Tornadus EX, so there’s still time to attach without Eelektrik; mostly it just gives up free Prizes. From what I’ve seen in my many losses, you may have a chance if you have a great start and they either draw into nothing, or you N everything of theirs away. You’ll definitely get the chance to N them to only one or two cards. Pokemon ParadijsDarkrai has this thing that it likes to use Eviolite, Dark Patch, Energy Switch (or Dark Trance), and Max Potion. If these on their own could ruin this deck, I wouldn’t be writing it, but together, it’s one of the worst things you can face. So there’s only a few things you can do to win. If your opponent places a Deino, do everything you can to take out that Deino. It’ll wreck your strategy more than anything if it evolves. If your opponent is clearly powering up a Pokémon to attack, drag it Active when you can; they can’t Dark Patch to the Active and will have to damage themselves. Hold onto your N’s (when possible, just be less liberal with them) until your opponent uses Junk Hunt to hopefully prevent them from playing extra Dark Patches. Don’t target a Pokémon that you can take an easy Prize from unless it’s an Eviolited Darkrai or a Hydreigon; take out whatever has the most Energy, even if you have to use Mewtwo. Getting an explosive start here won’t quite guarantee you the win, but it’ll get you much farther than it will against Terrakion and Landorus decks. You can win with a little luck and a lot of skill and smart plays. Garbodor on its own is an inconvenience, but not something you can’t beat. Usually Garbodor isn’t the problem though; it’s the Terrakion and Landorus EX that it’s paired with. If they spend lots of resources on Garbodor, you can win. If they only draw into Garbodor, you can win. Raikou doesn’t like Landorus either. He thinks this cat-dog thing is just a phase he picked up from reading Tumblr. The trouble in testing against Eelektrik variants is that there’s a lot of different Eelektrik decks. I played against several different kinds, all with more or less the same results (barring Rayquaza EX, more on that below). You need a good start, and it depends on what they’re running. Do not play down any Tornadus unless you absolutely have to. As with any strict Eelektrik variant, aim for the Eelektrik; you can snipe one for 20, and then Catcher it when you can for the remaining 70. If they have Raikou EX, they have a slight edge with that card. It opens them up for Max Potion more easily, they’ll hit your Eelektrik on the Bench, and it gets Energy in the Discard to avoid Electromagnetic Wall. Zekrom and Ampharos will most likely exchange 2HKOs. You can’t OHKO a Tornadus EX, but it can’t OHKO you either. You can evenly 2HKO Bouffalant, and it won’t do extra damage to Ampharos, although you can’t damage it on the Bench. These are the most common things I saw in Eelektrik decks, otherwise I’m not sure it’s worth writing about since a lot of other attackers are covered elsewhere. A small advantage is that most of these decks use Special Energy, which they can’t Dynamotor. You’ll get at least a few damage counters on the field from your Ability. eBayIt sounds obvious in theory, but going into this matchup and honestly thinking it out, it didn’t sound great. Blastdeo may have been overhyped depending on your opinion, but it’s still played for a reason. 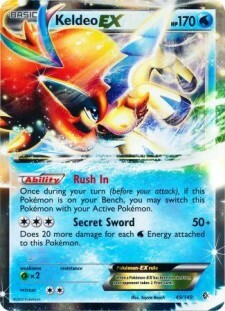 With only three Energy on it, Keldeo easily 2HKOs you, and 90 damage from Energy drops leaves it out of KO range. If you Catcher anything to 2HKO it, Keldeo is only going to Rush In. Turns out if you can set up by the third turn (or later even if they can’t set up), it’s harder to lose this one than win. Using Skyla for Catcher is more important than you’d expect against a deck with Keldeo, and sniping the Bench is very profitable, if only to burn out their Max Potions. If they place a Squirtle, Catcher it. If it evolves to Wartortle, snipe it for 20 before Catchering to finish it off; some opponents will Max Potion off that 20 damage just to keep it alive. Blastoise is a little harder, but two Catchers and it’s off the field. Do not use Catchers on anything but the Blastoise line, short of playing one before Junipering. If they can’t keep Keldeo powered up by dropping multiple Energy at once, it’s still taking damage from Electromagnetic Wall bit by bit, but they can’t keep up with KOs. 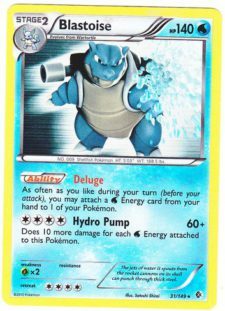 No matter how much Energy is put on a Keldeo EX, if there’s a Blastoise on the Bench powering it up, take that out first. 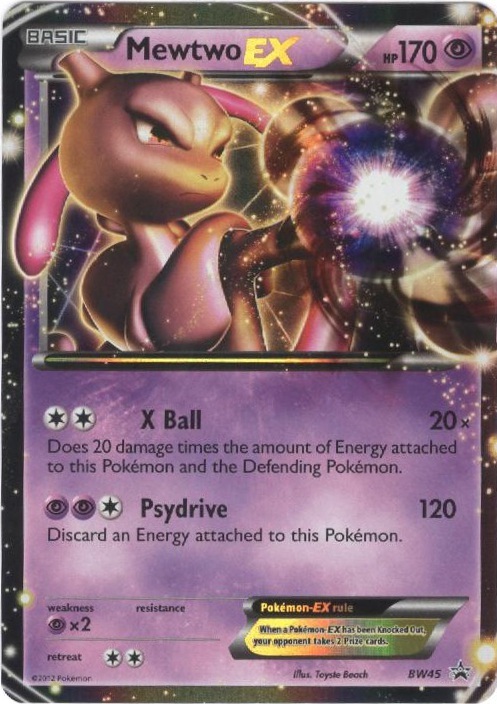 If there is a high-Energy Keldeo powered up before you got Ampharos Active, Mewtwo is an acceptable attacker. Eelektrik decks are scary for the same reason as Dark Patch, but for some reason, Rayquaza just doesn’t share the challenge. It has to manually attach Fire Energy, but Eelbox manually attaches Special Energy. Rayquaza EX hits for more damage than other attackers in Eelbox, and it can easily OHKO Ampharos. But after playing this deck, I realized a few of the reasons this match leans heavily in your favor are the same reasons I personally don’t like this deck. First thing is the attacks on both Rayquaza that aren’t called Dragon Burst. You’ll be using Celestial Roar and Dragon Pulse in the early game, but in that early game, you’re more likely to hit important cards than one of your approximately 11 Energy in the deck. This is the case for all decks that play against Rayquaza, it’s just a shortcoming in the deck itself. But remember that Rayquaza needs to manually attach a Fire Energy, which puts Rayquaza at 140 HP: even 2HKO. Eelektrik falls into the same snipe-trap as Wartortle; snipe it then Catcher it to KO it. If there are any Tynamo on the field, make them your snipe targets if you don’t have Catcher. Shred isn’t enough to have an even prize exchange for Rayquaza DRV, since it loses a Fire Energy that it should be using to Dragon Burst. There is one thing to watch out for, if you can’t disrupt their setup. Hold onto your Rare Candies and don’t Juniper or Ultra Ball them away unless you absolutely have to, because Rayquaza is one of the few cards in format that OHKO’s you and isn’t a Fighting type. They can quickly take the lead with a few lucky discards and power up a Rayquaza before you can Candy into Ampharos multiple times. Yeah I know, sounds almost too obvious to say. But this is a lot like Keldeo where it sounds good, then it’s less favorable when you think about it, and suddenly it’s positive again. You OHKO Empoleon before Giant Cape, but it’s a low-Energy deck. It also runs Terrakion or Accelgor (I believe these are the only two successful Empoleon builds, and they’re the only two I run into more than rarely) which can hurt you a lot. The instant you see you’re playing Empoleon, drop Tornadus on the Bench; it helps versus both variants. 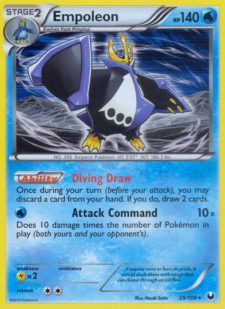 A common focus in this deck is on Empoleon and Giant Cape. Turns out it’s not really a problem since one snipe or one Energy drop under an Active Ampharos negates it entirely and you’re OHKOing again. Against the Terrakion matchup, keep Ampharos Active anyways, and power up Tornadus on the Bench. It’ll revenge-KO Ampharos, but you’ve got a Tornadus that hopefully can revenge-KO the Terrakion. Against Accelgor, keep one or two Energy on Tornadus; Switch out the Active Paralyzed Pokémon, and discard an Energy to retreat the Tornadus. You can only do this as many times as you have Switch, so what you want to try for is sniping the Accelgor or Shelmet when it’s on the Bench, and Catcher-KOing if it doesn’t hide in the deck immediately after. The recommended setup here is Active Ampharos, Bench one Eelektrik, one Tornadus, and possibly keep an Ampharos in reserve. This is the minimum you’ll need to win, but still keeps you out of PlusPower-OHKO range for Empoleon. If they’re a Terrakion-heavy build and can successfully swarm, power up a second attacker that isn’t Ampharos, hopefully another Tornadus. Lean away from Ampharos when your opponent is low on prizes (three or so). This caption is a dig against Reshiboar. This isn’t just a dig at Reshiboar, and I’m not really saying you should tell your opponent to give up and call the judge when you see them flip over a Fire-type. Just know in your head that if there’s an Emboar on the field, you’re going to have an easier game as long as you don’t get too cocky to play right. Most attackers with Emboar take a lot of Energy to power up, and don’t have the HP to keep up. They also tend to discard Energy or damage themselves, so even if you’re late on getting out Ampharos, there’s little to worry about. Reshiboar is still seen sometimes; Outrage is something to watch for on Reshiram BLW, so take it out with an EX rather than Ampharos if it has less than 60 damage on it (two Energy will take care of that). Reshiram EX is a little more worrisome as it most often has Eviolite and may have attached a DCE before you got out Ampharos. Mewtwo EX is usually the best way to take it out. Charizard BCR is something I somehow continuously run into; I don’t think it’s a common deck, but since I keep seeing it, I’ll explain it. It can OHKO Ampharos, but it discards Fire Energy from itself and takes five Energy to use that attack. It’s not a problem; in fact if you snipe it once and Ampharos is Active the whole game, it can’t fully power itself up because it KOs itself from Energy drops. Great artwork courtesy of purplekecleon. Most of the decks Ampharos is best against are below tier one or are less common, which is what most keeps it out of the meta I believe. The other problem is that to keep a consistent list, there’s little room for error and few free spaces in the list. This deck would probably do best somewhere with very few tier 1 metagame decks, or in Juniors or Seniors where players are more often reliant on parents to understand that yes you do need that much money for a card. Ampharos isn’t the cheapest junk rare around, but a set of three costs less than most EX cards, and most people are willing to trade theirs away. Questions? Comments? Suggestions? Throw them in the comment section. 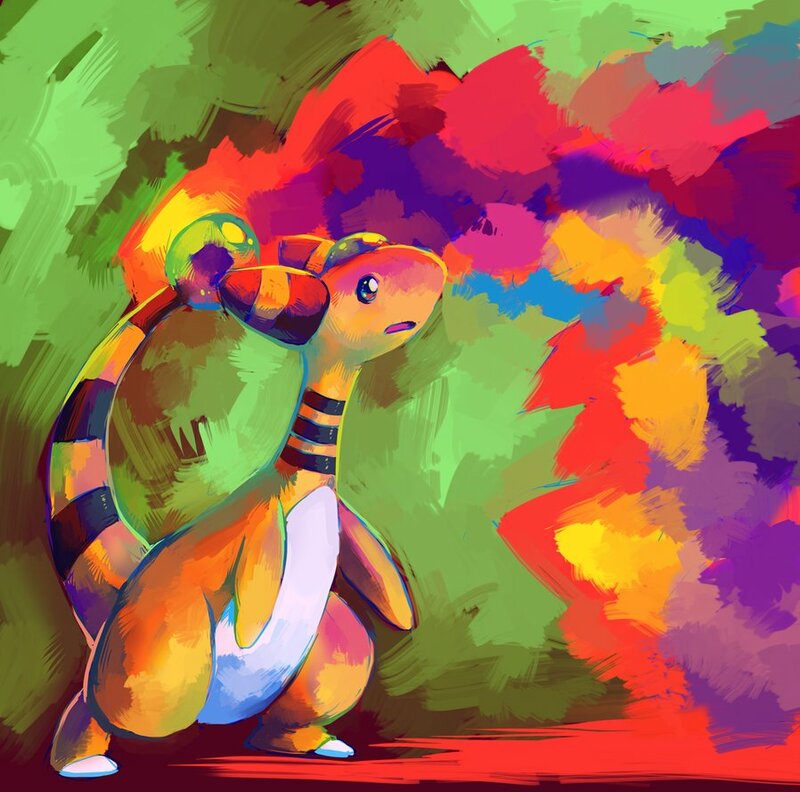 Ampharos is so awesome! I’ve always loved his cards themes of punishing the opponent. Nice article Merrisa! I’m impressed that you were able to make Ampharos work. A+! For the record, she stole my TCGO login and tested like mad while I was sleeping using my account. Tested, Catcher doesn’t wreck it more than any other deck. Three Switch prevents stalling, a DCE can safely be used to retreat once or twice, Eelektrik allows you to retreat for Lightning Energy, and losing Eelektrik doesn’t hurt as much as it does for meta Eelektrik-based decks. 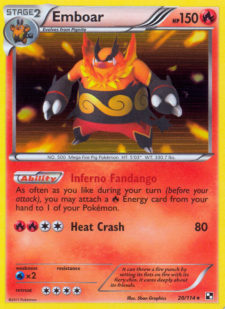 If any deck would not be played because Catcher made it hard to play, the meta would be almost nothing but Darkrai, Keldeo, and Pokemon that cause retreat lock. Yeah It works!!! 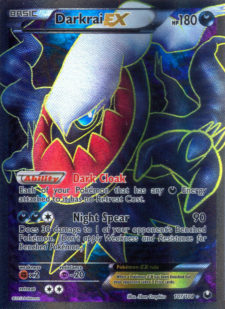 Unless against Eels and Darkrai. Those decks are 70% of the meta. Bless you for writing this. It shows that, just because you want to play with your favourite Pokemon, you can still build a deck that isn’t complete crap, even if it isn’t uber competitive. That’s a topic that needs a lot more attention. Captions were good, the article was full and informative. However, one thing that made me wonder: The title is “Fun Decks You Can Almost Take Seriously: Ampharos DRX”. Decks is plural, so will there be more of these types of articles? Hopefully! Depends on how many popular gimmick cards I can get working to have at least one positive meta deck matchup. I’ve got a list of potential decks from ones people have asked about, or just ones I keep seeing everywhere. Well yeah, that’s part of the reason I wrote it. We’ve rejected at least one article that writes positive matchups across the board for Ampharos, until you actually test the given lists. This was based on a request on the forums, and to show that the deck, at it’s best, is only mildly competitive but still playable. People are always asking for articles about new or different decks, but new decks are rarely super-competitive just because the best decks are (usually) already being played. Although I’m not hearing much about Rayquaza-less Eelbox anymore, maybe it’s an area difference. Can’t swing a fainted Skitty without hitting Darkrai/Hydreigon or Rayeels or Keldeo from what I’ve seen, so it goes positive there. well, catchering around ampharos makes its ability useless. 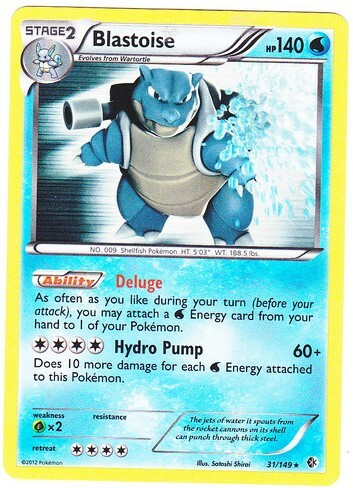 for instance, a blastoise player will catcher a non-ampharos pokemon first then attach energies like crazy. With the rest of the decks, one or two turns of attaching just wasn’t enough to make or break an entire matchup; maybe a few games but not the matchup itself. Against Rayeels, that no-damage Fire Energy drop could turn the game around due to the extra turn it took an Ampharos to KO, as long as they took out the Tornadus EX first and had Eviolite. Against Empoleon with Giant Cape, it could mean an extra 100-ish damage on your side of the field, and a little worse if you didn’t have Catcher to snipe. Those were pretty much the only times Catchering around the Ability consistently was worse than your opponent going first and dropping two Energy before you’re even allowed to have Ampharos on the field. Annoying, but not frustrating or devastating. Genguy’s Regionals Report + Deck List!